David Pea’s abilities as a sculptor, mold maker, and fashion designer have taken him in many directions and to different parts of the world. The Toronto native could always see things that others could not when it came to costume design possibilities. While working in Italy’s fashion center with such fashion power houses as Canali and Versace, Mr. Pea began to see market opportunities and a way to marry his sculpting and mold making abilities with his costume experience. His high-end full body costumes were bold, unique, and introduced designs unseen in the industry before. In developing and refining his craft, however, materials available in Italy were limited to leather and other conventional materials that did not satisfy his imagination or vision. Mr. Pea returned to Canada in the late 1990’s and started UD Replicas in 2001. As his costumes continued to gain notoriety and acclaim, business took off. He received offers to create costumes for films, corporations wanted costumes to assist with promotion of their brands, and much more. Scouring The World For Material Options - To bring his art to the next level, he needed to know a lot more about what was available. He spent years experimenting with material from manufacturers all over the world to begin testing and determine what works and what doesn’t. 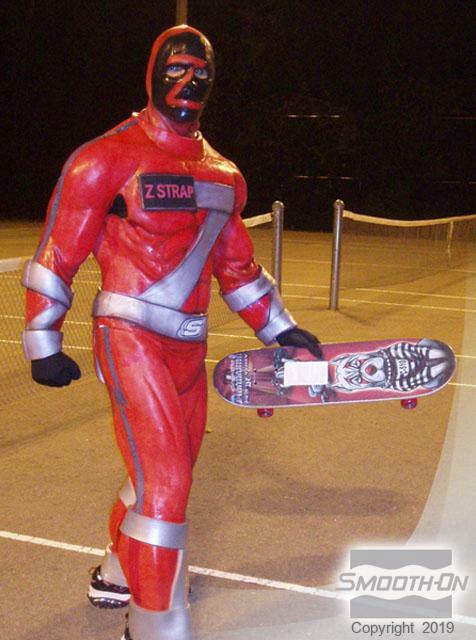 His earlier costumes incorporated latex rubber. Latex, however, was labor intensive to use and dried out over time, causing cracks and tearing when the wearer moved. Urethane rubbers were next on the scene and offered great immediate tear strength but were not paintable, limiting design latitude. Urethanes also exhibited poor long term tear strength and after a several months costumes began to show signs of wear. Closing In On The Perfect Material - UD Replicas “dream” rubber product for making costumes would; 1. Withstand extreme bending and flexing at critical stress points on the costumes several thousand times without tearing. 2. Be paintable and the paint should bend and flex with the rubber without cracking or flaking off. Enter the Dragon - Dragon Skin™ silicone rubber arrived on the scene and exceeded expectations. In addition to being virtually indestructible, Dragon Skin™ is easy to work with and very precise with comparatively no shrinkage or expansion. A slower, “sister” product to Dragon Skin™ called Smooth-Sil™ 910 has since been introduced and Universal Designs now uses both. 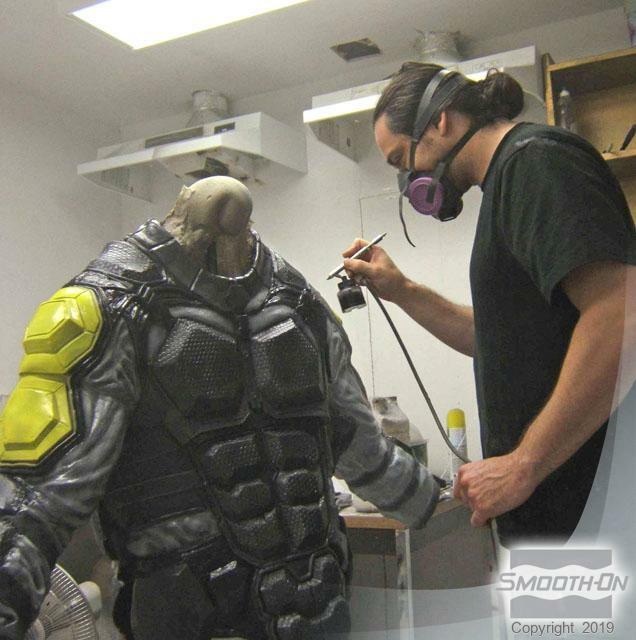 Psycho Paint™ is used to paint each costume and, once applied, fuses to the rubber. It bends, flexes, and will never separate from the rubber. Mr. Pea no longer has to compromise on materials and they last indefinitely. Repairs of costumes made with these silicones hav been virtually eliminated, letting the Universal Design team focus on what they do best; designing the next spectacular costume. 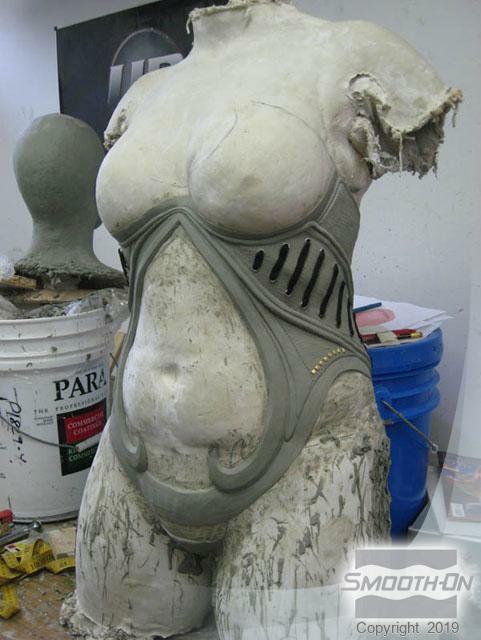 Corset sculpt created on a plaster lifecast. Corset casting in Smooth-Sil 910 with Slacker added. Skin Tite is used to bond the piece to the skin. The finished corset flexes with the model's body. The 'lightning' weapon is cast in tinted Clear Flex 95 urethane rubber. 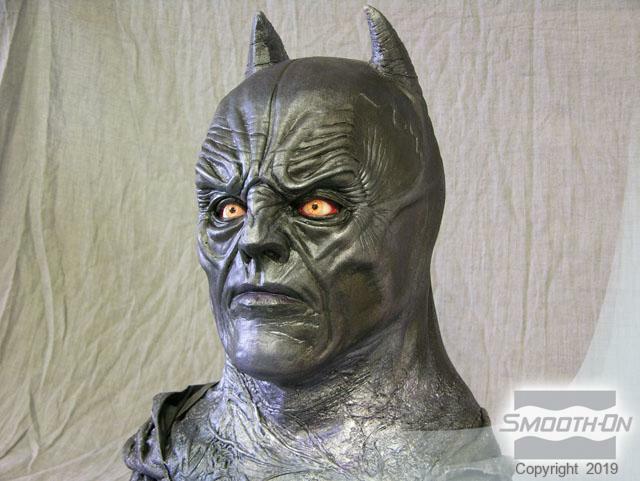 'Dark Knight' bat armor sculpted on plaster lifecast. Dragon Skin castings are checked for assembly fit. 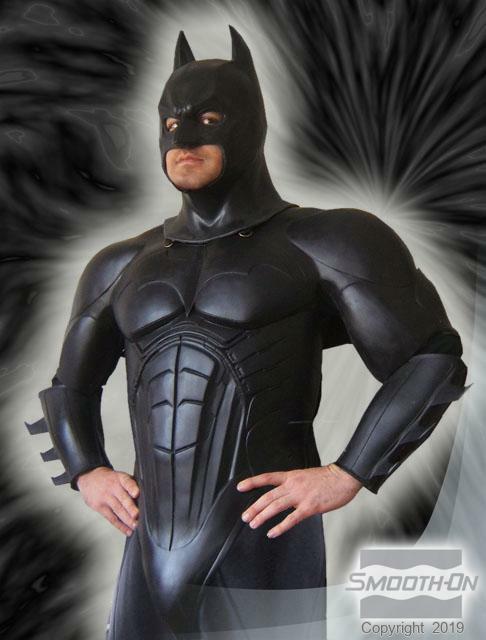 The final Dragon Skin 'Dark Knight' armor suit and cowl. 'Batgirl' suit sculpted on a plaster lifecast. 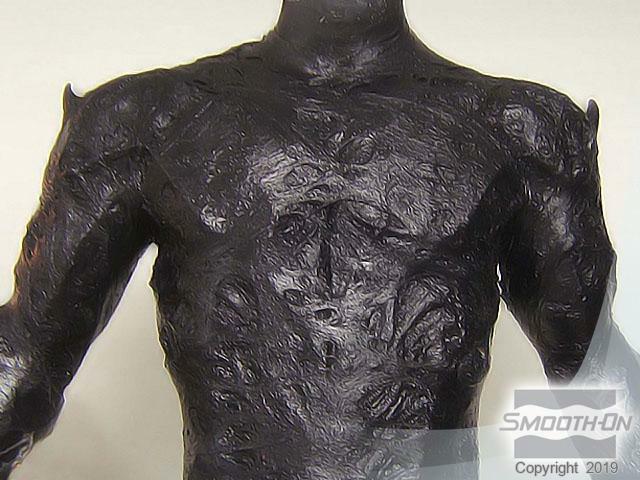 The Dragon Skin cast suit is painted with Psycho Paint. 'Batgirl' face mask is cast in Flex Foam-iT! 25. 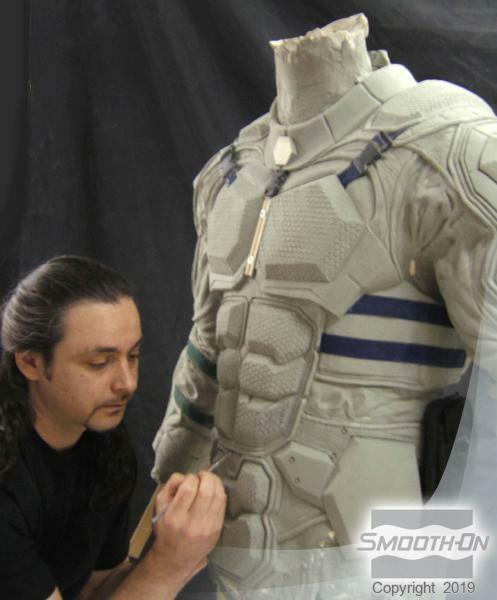 'Haze' video game suit sculpted on a plaster lifecast. 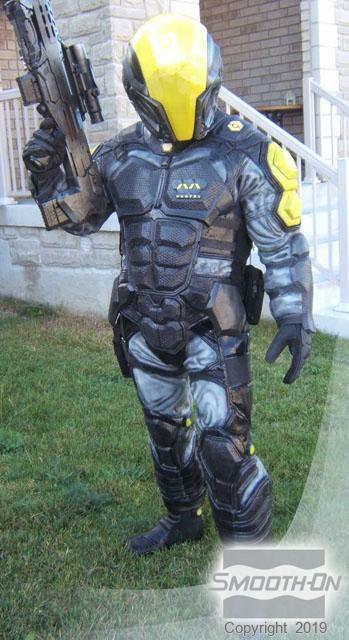 Smooth-Sil 910 suit is painted with Psycho Paint. Final flexible silicone suit with helmet attached. 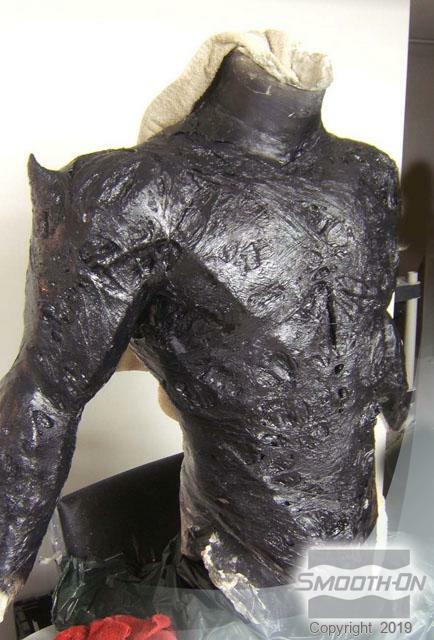 'Batman Begins' style 'Demon Bat' suit cast in Dragon Skin. 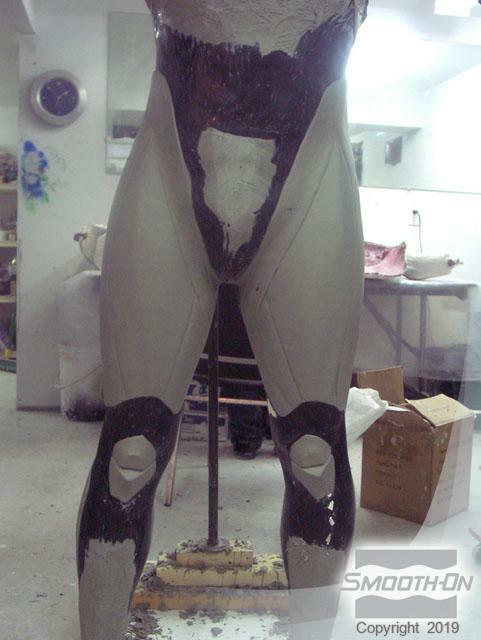 The suit surface is painted with Psycho Paint silicone paint. The matching mask is cast in Dragon Skin with Psycho Paint accents. 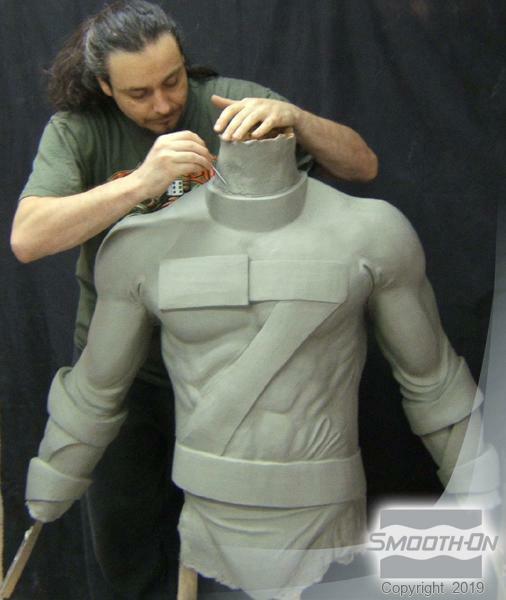 Sketchers' 'Z-Strap' costume in process of being sculpted. 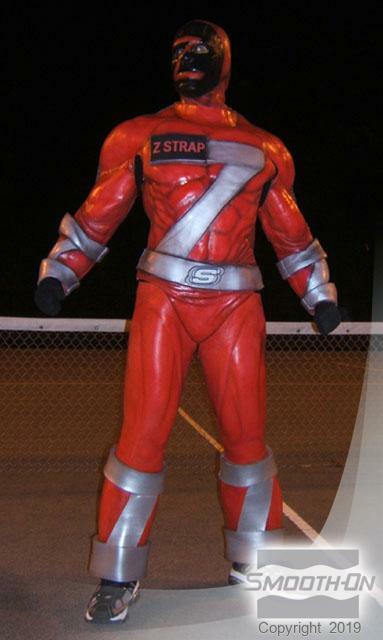 'Z-Strap' suit painted and being work by a model. The finished suit was completed quickly and is a successful branding tool for Sketchers.